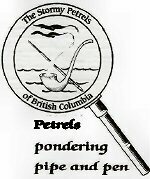 On January 9, 2010, the Stormy Petrels will honour the great detective by hosting a birthday celebration. He called himself “middle-aged” about 1889, and was described as being 60 years old in 1914, suggesting a birth date of c. 1854. The third annual Birthday luncheon will be held at The White Spot (West Georgia/Cardero) at 11:15. It is an informal luncheon, although we may have a guest speaker. For the previous twenty years, the Petrels have celebrated this day with a more formal dinner. The dinner now takes place in March, and detail will be available at a later date. This dinner celebrates the birth of a great partnership – Holmes and Watson – at which both men are honoured. Please let Fran know if you are able to attend.